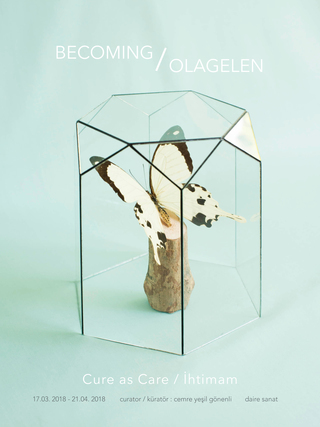 Daire Sanat is happy to announce the exhibition entitled Becoming: Cure as Care / Olagelen: İhtimam curated by the artist Cemre Yeşil Gönenli and the limited edition book published by FiLBooks and Daire Sanat. The exhibition can be visited in between 17th March — 21st April 2018. As an artist, academician, photographer and perhaps a curator 'to become', Cemre Yeşil Gönenli aims to create a space to ‘learn and teach’ under the shadow of ‘sharing’ and ‘becoming’, by bringing together not only all those people she has learnt from; like her students, her teachers, and her peers, but also their various stories on ‘becoming’ they have told through photographs. “Becoming” is many things, but first of all it is about “being” and it is about “coming”. It is both about an arrival and a departure. It is strongly tied to past, present, and future. It is also about waiting, with or without knowing it. Becoming carries the weight of change which makes life both beautiful and painful. In return, we all carry the marks of change in our bodies and souls. It is a process of transformation which brings out many questions. Becoming is biological, chemical, evolutionary, psychological, physical, philosophical, social, political, personal, and interdisciplinary. The strange thing is that becoming is already out there in our lives even before they begin. We come to “be” before we become ourselves. There is another thing to consider in the relationship between consciousness and becoming. There must be a reason to why we do not remember about the time passed in our mother’s belly, or even the first 3-4 years of our lives. The great unknowns of becomings hide the real essence of life, and perhaps it is the constant becomings that keep us from becoming insane. Becoming is magical and it is full of wonder. How does one come to be and what does it take to emerge; as a baby, a plant, an artist, a child, an adolescent, a gay, a couple, a fighter, or a mother? This exhibition does not attempt to answer all these questions, however the photographs that fill the rooms of Daire Sanat are definitely filled with the pleasure of “becoming.” The exhibition travels through various stages of change depending on the issues of age, gender roles, responsibility, love, sexuality, politics, culture, and nature. For the artist-curator Cemre Yeşil Gönenli this exhibition is a letter written for future. She seeks to create a space and a time to photographically meditate on the joy and the wonder of her own becomings. She tries to learn how to “take care” by curating this exhibition that invites us all to mediate with our own becomings. click to see the "Becoming" book!